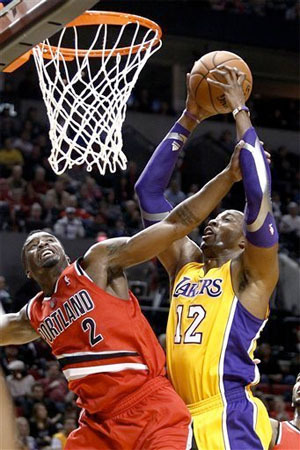 Dwight Howard is fouled as he goes up for a dunk. The Lakers got huge games from both Dwight Howard and Kobe Bryant, but turnovers and bad defense did them in again, as they dropped to 0-2 on the young season, with a 116-106 loss in Portland. For the second straight night, the Lakers floundered and flailed, and were again unable to mount any real consistent play in dropping yet another game in Portland. In actuality, the Lakers have lost 12 straight games if you go back to last season, and count the preseason contests. To add insult to injury, Steve Nash bumped knees with Blazer rookie Damian Lillard in the first half, and was unable to play more than 1:16 of the second half. Dwight Howard, however, did bounce back from a very tough first game to score a game-high 33 points, to go along with 14 rebounds, and five assists. He also hit 15-19 from the foul line, a day after shooting just 3-14 against Dallas. Kobe Bryant had 30 points on 10-20 from the field, and Pau Gasol added 16 points and nine rebounds. Beyond those three though, the Lakers got just 27 points from the rest of the team, with the bench struggling again, scoring just 15 points. Ironically, they actually outscored the Trail Blazer bench 15-13. But the bench play is clearly an issue early on as no player had more than seven points, and forced Mike Brown into playing his starters big minutes again. The feisty Blazers played very well, led by Nicolas Batum’s 26 points and six rebounds. Rookie Damian Lillard dazzled 23 points and 11 assists, and Wesley Matthews dropped in 22 including 4-6 from the three-point line. Portland turned a close 62-57 halftime lead into a rout late in the third quarter. After the Lakers had cut the game to 79-76 on a layup by Howard, the Blazers closed the quarter on 13-0 run to blow it wide open. The Lakers were never able to get closer than eight the rest of the way, as they continue to turn the ball over at an alarming rate. The Lakers did shoot well for the second straight night, hitting 36-72 (50.0%) from the floor, and 26-32 (81.3%) from the foul line, a day after hitting a miserable 12-31. However, Portland shot even better at 42-83 (50.6%) from the field, including 9-20 (45.0%) from beyond the arc. The Lakers won the rebound battle, not surprisingly, 45-30, but did give up way too many second chance points. J.J. Hickson and Batum combined for nine offensive rebounds. So Friday, the Lakers will try to notch their first win since May, when they take on the Clippers at Staples Center, as the home team. They also may have to do it without Steve Nash, whose status for Friday night’s game is unclear. Remember to check out our box scores and stats, as we update them nightly right after the game. 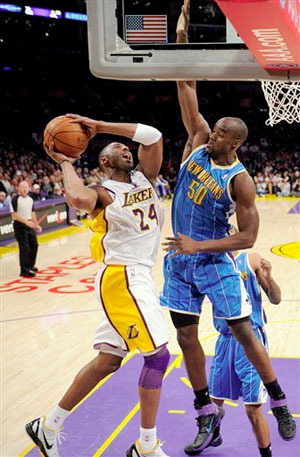 Kobe Bryant drives hard to the basket against Hornets. The Lakers just keep rolling right along towards the playoffs, as they took care of the New Orleans Hornets 102-84 at Staples Center on Sunday night. Kobe Bryant, who scored 79 points in his previous two games, poured in a game-high 30 points to go along with five assists, as the Lakers won their seventh straight game, and have gone 15-1 since the All-Star break. Los Angeles jumped on the David West-less Hornets early, and led 30-19 after the first quarter. After getting up by as many as 18 points in the first half, the Lakers settled for a halftime lead of 57-41. The Hornets played much better in the second half, and were able to rally back behind the inspired play of Carl Landry, who is starting in place of West. New Orleans got to within six points in the fourth quarter at 78-72, before the Lakers went on a 24-12 run to close the game, and win going away by 18. Pau Gasol had a big night with 23 points, 16 rebounds, and four blocked shots. Andrew Bynum battled foul trouble all game long, and played just over 21 minutes, but he did have 13 points and five boards in his limited action. Ron Artest was the only other Laker in double figures with 11 points on 4-6 shooting from the field. For the game, the Lakers shot 41-85 (48.2%) from the field, 17-21 (81.0%) from the foul line, but only 3-17 (17.6%) from beyond the arc, with Bryant hitting just 1-6 from deep. The Lakers won the rebound battle 44-43 and committed just nine turnovers. New Orleans struggled shooting the ball all night, finishing at 40.2% on 35-87 from the floor. They were also a miserable 3-17 (17.6%) from the three-point line, with Marco Belinelli convering just 1-7 from long range. Landry led the Hornets with 24 points and 10 rebounds playing almost 44 minutes. Emeka Okafor had 14 points and 11 rebounds, and Chris Paul had an off night scoring just 10 points on 4-9 shooting, but he did have nine assists. No other Hornet scored in double figures. The win put the Lakers’ record at 53-20, and they are one game ahead of the Dallas Mavericks for second place in the Western Conference. The two teams will get together on Thursday night for a battle at Staples Center. San Antonio dropped their third straight and are now 57-16, just four games ahead of the Lakers for the conference lead with nine games remaining. The champs will get three days off before they take on Dallas, and will try to complete a 7-0 homestand. Sometimes long layoffs can be a bad thing for a team playing well, but the Lakers know they have to be at their best in what will surely be a playoff-like atmosphere on Thursday. The Mavericks and Lakers have split their first two games this season, with the Lakers beating the Mavericks 96-91 in their last meeting in Dallas.